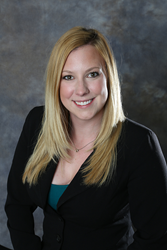 AmeriFlex® Financial Services is pleased to welcome Hannah Buschbom, CFP®, CDFA as Partner. AmeriFlex® Financial Services, a Santa Barbara, CA based privately-owned financial services firm, announced today the appointment of Hannah Buschbom, CFP®, CDFA as partner. Hannah’s responsibilities include leading the financial planning department and working cooperatively with clients to develop creative solutions to their often complex scenarios. This method, she says, helps clients reach their preferred outcomes – for example, stacking income sources to fund retirement needs, or monetizing a home or business to create liquidity. Hannah received her Bachelor’s Degree at Westmont College in Economics and Business with a focus in Accounting. Her additional accomplishments include the designation of Certified Divorce Financial Analyst Designation® (CDFATM) and CERTIFIED FINANCIAL PLANNER™ (CFP®). Hannah is active in her community by volunteering for Team in Training (http://www.lls.org), an active member of the Junior League of Santa Barbara (http://www.jlsantabarbara.org), and serves on the board for DAWG (http://www.sbdawg.org).